In 1986, Jim and Tammy Faye Bakker's Heritage USA was the third most-visited amusement park in the US, behind only Disney World and Disneyland. Now the park that once entertained millions of guests is falling to pieces, and looks more like the scene from a post-apocalyptic movie than a place for family fun. Heritage USA opened in Fort Mill, SC, in 1978, and by the mid-eighties drew in six million visitors each year. The park was perhaps best-known for "Jerry's Slide," a 163-foot water slide that Falwell slid down in his suit, resulting in one of the most famous photographs of the televangelist. 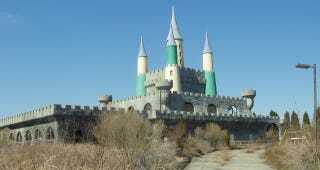 But those water slides and fairy tale castle were, in part, responsible for Falwell's downfall. After scandals regarding Falwell's fundraising efforts to build the park's never-completed hotel and the IRS's revocation of its tax-exempt status, Heritage USA was hit by another, more physical blow. Hurricane Hugo wreaked havoc on the park's buildings in 1989, and Heritage closed for good shortly afterward. These photos all come from Tommy and James. Visit their site for even more photos of the abandoned park.